TAE – Perkins Technologies | Specialised manufacturers of Engine Condition Trend Monitoring systems for turbine and piston aircraft. "Aircraft operators worldwide trust DAAM to monitor engine usage and lower operating costs"
Unmonitored exeedances of an aircraft’s system parameters can cause serious engine damage over time, increasing safety risk and maintenance costs for operators. The DAAM (Data Acquisition Alarm Monitor) System allows pilots and engineers to easily monitor engine usage, recording trends, exceedances, hot starts and other potentially damaging events that standard instrumentation doesn’t detect. The system continuously monitors up to 13 engine and airframe parameters, recording usage and performance data. If an exceedance occurs, an alert on the Cockpit Display Unit (CDU) allows the pilot to take immediate corrective action. All data is stored securely for later analysis by maintenance personnel. Developed in Australia, DAAM is the worldwide leader in affordable Engine Condition Trend Monitor (ECTM) technology. Our robust data loggers can be found in fixed-wing and rotary aircraft in countries around the world. Find out if DAAM is available for your aircraft. 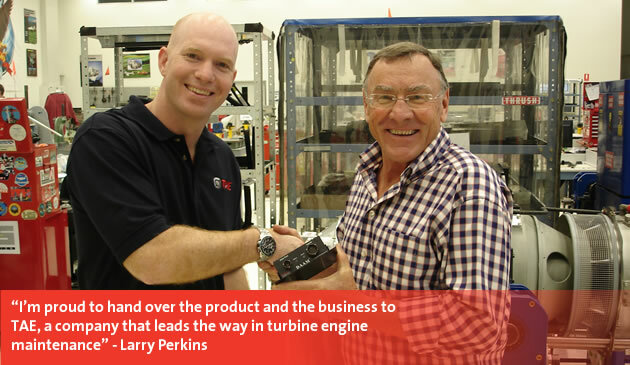 TAE Aerospace acquired Perkins Technologies in December 2013. TAE Aerospace's CEO Andrew Sanderson said: "By combining this innovative Australian technology with our existing turbine maintenance, engineering and reliability management capability, we can offer our customers a whole new level of support to keep them flying for longer." New DAAM Software V2.86 now available for registered users. New DAAM Software V2.84 now available for registered users.